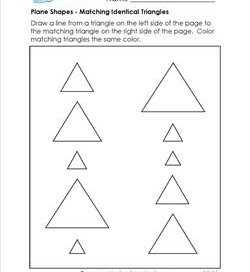 Our triangles worksheets will help your students to identify, match, and draw triangles. Children will also be challenged to find triangles in their classroom environment. How many can they find? Triangles aren’t as plentiful as circles, squares, and rectangles, so you may need to make sure there are plenty for them to find. The “tri” in triangle means that these shapes have three sides. If you turn a triangle with three equal sides around, which side is up? Do triangles have to have three equal sides to be called a triangle? 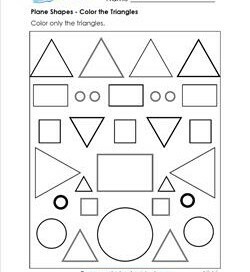 Here’s a plane shapes worksheet where kids identify the triangles by putting an X on them. Then they can color the same shapes the same color. 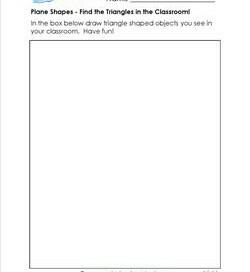 This plane shapes page is designed to have your kids clip it on a clip board & walk around the classroom looking for triangles & then drawing what they see. 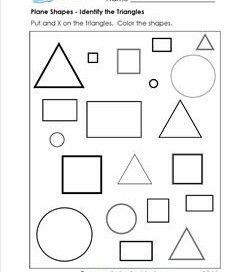 In this plane shapes worksheet kids draw a line matching the identical triangles. 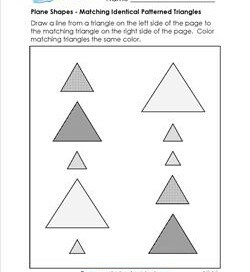 Then they can color matching triangles the same color. Draw a line from a triangle on the left side of the page to the matching triangle on the right side. Kids draw a line matching triangles with the same size and pattern. The little triangles could be tricky!